If you’ve read very much on my blog, you know that I am all about a balanced approach to keeping up your home. A little here, a little there, and it really does add up. This realistic, more balanced approach is the key to maintenance. But what if you don’t want to just maintain? What if you are looking for a change? That is when you have to give a burst of energy. That is when you will have to stop doing things the way you’ve always been doing them. That is when you have to be intense about your goals and do big things to make them happen. The baby step to change approach looks really good on paper, but it doesn’t usually work. Baby steps lack momentum. For each baby step forward, you end up taking a baby step back, so really you are just baby stepping in place like you’re on a treadmill. You’re stuck. If you want to do something difficult and make a big change, be intense and give it all you’ve got. People ask me why I setup the 91 Day De-Clutter Challenge like I do. It is an enormous undertaking to declutter your entire household in 91 days. For most people, this is a big change. People begin the 91 Day DeClutter Event because they are sick of living in clutter. They want the peace of an organized home. Undoing years worth of clutter-gathering is not something we can minimize with 5 minutes of simple tasks each day. If your home is already clutter-free and organized, we can talk about good maintenance habits and 5 minutes a day is awesome. 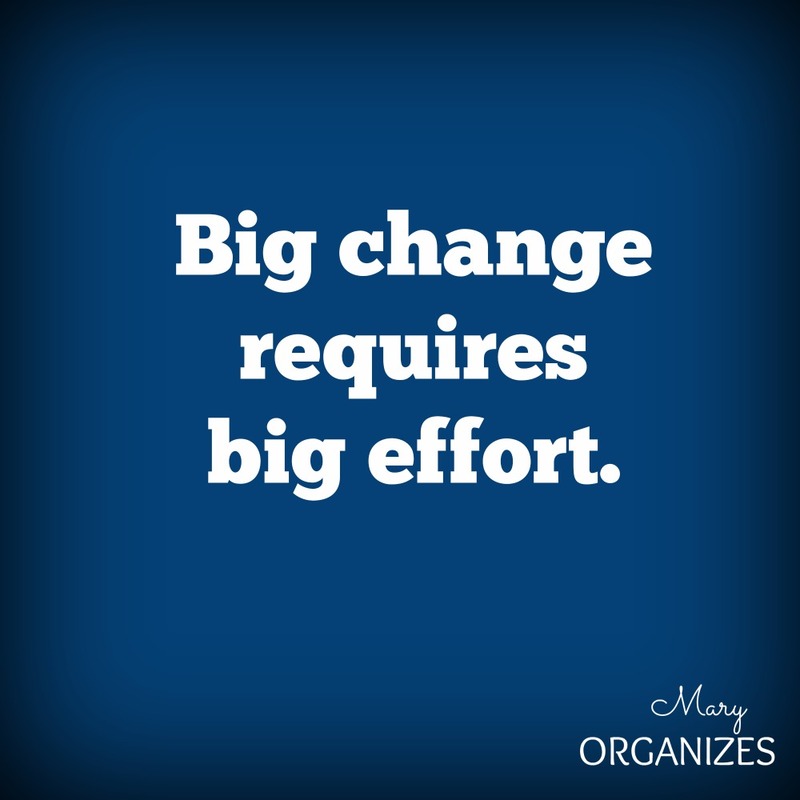 But if you have a big change in front of you, you are going to need to give a big effort. Times of change and growth require completely different levels of commitment than times of maintenance. Maintenance is fantastic. There is so much freedom in maintenance. I have more time for my hobbies and my family when I’m simply maintaining, instead of pushing for a big change. I can have my home completely tidied top to bottom in less than an hour. I can deep clean my entire home by myself in less than three hours. I’m completely caught up on laundry 99% of the time. I have a lot of habits that keep my home maintained, and those are the tips that I post regularly here on the blog: my cleaning schedule, my laundry schedule, and my regular decluttering. I don’t say all of this to brag, but rather to give you hope. I want you to see the light at the end of the tunnel. I want you to see why the big effort is worth it. You can have this too. Want to change? Want to grow? Give the tasks ahead a great big burst of energy. Totally need to hear this right now as I’ve been doing my own version of your 91 day challenge and need a big push to get all the stuff I have been gathering OUT this weekend. I’d love to have a copy of your cleaning schedule, laundry schedule, and regular decluttering schedule. Enjoy your posts, and I have been working on the 91 Day De-clutter with great success. What a great reminder! I completely agree that to accomplish big goals, you need focus time and energy to dedicate to them. Thanks for sharing!